When selling a one-of-a-kind asset, how do you estimate “fair price”? How do you know whether an offer is “high”? How do you determine what price is absolutely the highest sale price possible? One-of-a-kind assets include real estate, businesses, original art, custom jewelry, and to some degree, used airplanes and automobiles. But the hardest to value is the business. Few comparable-sale data are available for small and midsize private company purchases/sales. In these cases, the only way to determine market value is to offer the asset broadly to the marketplace and solicit offers. Offering it “broadly to the marketplace” does not necessarily mean offering it to the world, but rather to persons or organizations that are likely to have both an interest in and the financial capability of purchasing the subject asset. Moreover, to get the highest price, one must introduce it to buyers that will place the highest value on it. That is, buyers that will tend to have the greatest amount of interest in the asset and – again – the financial capacity to pay a premium price. The buyer willing and most able to pay the highest price will typically be the buyer that is able to generate the most money from it. So to maximize sale price, it makes sense to identify buyers with characteristics (i.e., aptitudes, capabilities, assets, rights, relationships, etc.) that might make our asset, when owned by them, even more valuable. Are known only by the owner-seller and, to a lesser degree, by his or her key employees. This makes for a very interesting relationship. The seller will have a financial incentive to highlight the positive and downplay – or even hide – the negative. So the business buyer approaches cautiously. And naturally the buyer will discount the offer in accordance with his or her level of certainty. If the buyer thinks the seller is not fully disclosing and, therefore, “there might be something I don’t know about,” the buyer’s willingness to pay will decline. In attempting to obtain the maximum price for an asset, it’s critical that the buyer be able to gather relevant facts. Furthermore, especially in the case of a business, the buyer needs to feel comfortable that all the relevant facts – both value-enhancing and value-diminishing – have been disclosed, because there is always an inverse correlation between risk and price. As a buyer becomes more clear and certain of the asset’s characteristics, the buyer’s perceived “risk of the unknown” falls and, therewith, willingness to pay rises. This is why it is so very important that a buyer trusts the seller and that the buyer believes the seller is honest and has disclosed each and every material fact about the asset. Let’s say that you’ve done the above-mentioned things well and you’ve received an offer. If you have a one-of-a-kind asset and no real comparables, how will you know whether the offer is just fair, good, or really great? Have it appraised? Well, an appraisal is simply one person’s estimate of value. The appraiser could be way off the mark in either direction. Always keep in mind that the appraiser does not know the value. Similarly, the appraiser does not determine the value. An appraiser simply gives an opinion of value. Granted, if the appraiser is well qualified to value the asset at hand, it should be an informed opinion. But for one-of-a-kind assets that have few comparables, like a business, the only way to really determine the market price is by going to the market. Yes, the present value of discounted cash flows is a nice financial tool, but it certainly cannot tell us what the market will actually pay. Does it estimate what the market will pay? Maybe. But I wouldn’t base my sale decision on some financial jockey’s calculation of net present value, at least not when hundreds of thousands of dollars, or maybe millions, are at stake. Multiple offers provide a context in which each offer may be evaluated. The market for any asset will reflect a bell curve. The horizontal x axis represents price from low to high (left to right). The vertical y axis represents the number of data points for each value on the x axis. 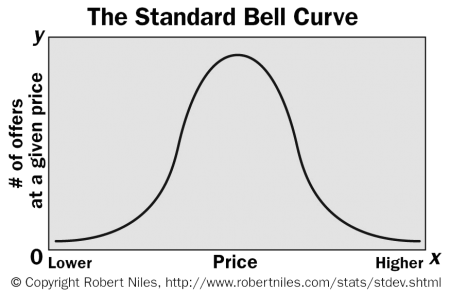 At the top of the bell curve, where price is moderate, there are many data points (i.e., offers to purchase). This is the most commonly offered price. But as price moves away from the center, fewer and fewer buyers are represented. Chart 1 depicts a typical distribution of data points within a bell curve. That is, 68% of purchase offers will be pretty close to the average. So if 15 offers are received, 10 will be in the middle section. 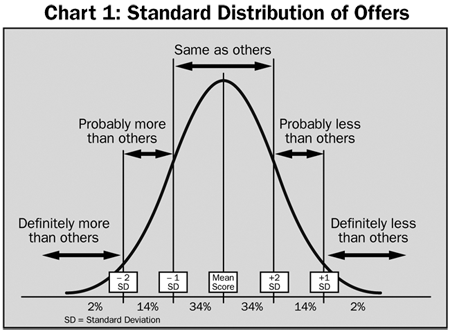 A normal distribution of data means that most of the examples in a set are close to the “average,” while relatively few examples lie to one extreme or the other. As the seller of an asset, we are less concerned about the left part of the graph. These offers are low. Offers to the right are our more attractive offers. The farther right the better. But we can see from the graph that just 16% of all offers lie to the right of the crowded middle section. The simple point I’m making is that if a seller hopes to obtain a price that lies in the upper 16%, he or she will have to count on luck, shrewdness at targeting a highest and best buyer1, or the lower-risk approach of garnering multiple offers and thereby increasing the likelihood that one will lie to the right in the top 16% of the market. The problem with both the luck and the rifle-shot scenarios is that the offer(s) obtained might indeed be “high,” but you won’t really know because you don’t have a context (i.e., other offers) to judge them in. 1 Another problem with the rifle-shot strategy is that, even if a seller can actually identify and skillfully approach the buyer that is most capable of buying at the highest price, the lack of competition from other buyers will almost always work to the favor of the buyer (i.e., allow them to buy for less than their maximum). This is because the seller cannot know the absolute maximum price that the buyer will pay. So, the only way to extract it is through skill and intense competition. How Many Offers Are Enough? Statistically speaking, 12 is the number where diversification begins to take meaningful hold. So for whatever asset you may be selling, it’ll take at least 12 offers for your bell curve to begin to take shape. You’ll be able to lay your offers out and get a pretty clear picture of where the mean (middle) is and where the outliers are. Statistically speaking, a top 2% sale can be considered “the very best price possible.” Unfortunately, for one-of-a-kind assets, the only way to really know whether an offer is top 2% is to get at least 50 offers from qualified buyers. For many asset types, such as small and midsize businesses, this will not be possible. Even so, every additional offer – be it the 3rd, 7th or 11th – provides meaningful context for the other offers and, therein, considerable added comfort and clarity. To illustrate, here are the 30 offers received for XYZ Company. As you can see, most of the offers are packed on the middle of the curve. In fact, the middle of the curve was actually determined by the offers themselves (that’s how this works!). Keep in mind that price is on the horizontal axis, not the vertical axis. 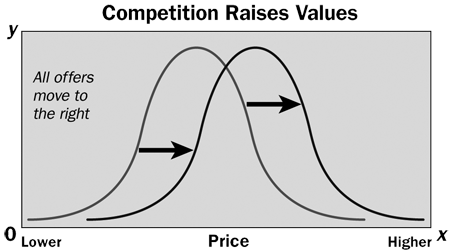 The bulge in the curve is created by the number of offers – not the price of the offers. In this example, the bulge in the curve is created by the stack-up of offers in the $10 range. 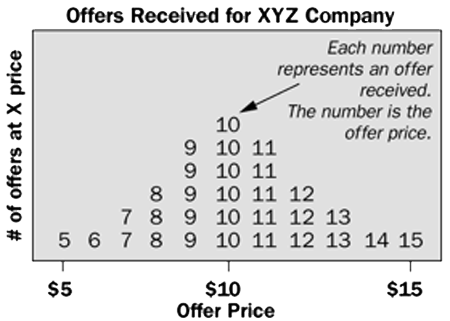 As the graph illustrates, we received a whopping six offers for $10. As the offer prices deviated from 10, however, they occurred less frequently. Just four offers were received for $11, just three for $12 and only one for $14 and $15. Obviously, we will try to sell our asset to the person that offered $15. If that fails, we’ll go to the $14 offer. What? You say maybe you could get the $11 offer to move up to $12 or $13? Well, yes, that is possible, but it’s pretty hard to do. For one thing, the buyer that offered $11 may be completely unable to pay $13. To get $13 you need to find a buyer that has the motivation and ability to pay $13. But again, this is hard for the seller to figure out on his or her own. So the rational approach is just to let the numbers work for you. That is, go to many buyers and increase the likelihood that a few will be willing and able to pay more than the rest. Finally, let’s say that a seller goes to just two buyers and one offers $14 – a top price. The problem is that without the context provided by multiple buyers (i.e. offers), the seller will not know how good this offer is. He might naturally assume, “Hey, if I received $14 right out of the gate then surely I can get more”. I’ve seen sellers use this logic and work themselves right out of great sale opportunities. Again, multiple buyers clear up a whole lot of questions for sellers. People are competitive. It is no surprise that motivated buyers, when presented with competition, will tend to pay more. This is why auctions work so well. The good news is that if you are a seller and you’ve offered your asset as we’ve suggested herein, all you have to do is let the buyers know about one another. Of course, there’s a right way and a wrong way to go about this, but it can be done. Acquisition Advisors has found that after receiving initial offers and making each subtly aware of the presence of other highly motivated buyers – some of which may be competitors – inviting suitors to rebid has proven to raise prices considerably. The effect is to shift the entire bell curve to the right as in the following graphic. The value of every asset type ebbs and flows over time. And so the timing of a sale can have substantial impact on value. Unfortunately, it is exceedingly difficult to accurately ascertain where one is in the cycle at any given time. Equally as difficult is predicting where prices will head in the future. So although the timing of the sale can and will greatly impact price, awareness of this reality does not prove very useful. What is within our control is the timing of when we receive offers relative to other offers received. When our goal is to sell a one-of-a-kind asset for maximum value, we need more than just multiple offers. We need these offers to “come in around the same time.” This is the only way we will be able to choose the best of the lot. Buyers will not typically “wait around” very long as we shop for an even better price. Offers get stale, things change, excitement wanes and the window of opportunity closes. Getting all offers within a set time, say three weeks, is also critical for using the power of competition. Competition can work only when competitors go head-to-head at the same time. Selling an asset as described herein takes a considerable amount of energy. It can also require a considerable amount of resources, experience and expertise to garner maximum price. This is why sellers of high-value, one-of-a-kind assets almost always delegate the task to a skilled broker. To be sure, the broker will charge a fee. Some sellers will attempt to avoid the fee by doing it themselves. Assuming the seller has the time and energy and is willing to dedicate it, at least one of the bases is covered. As for the expertise, experience and resources, the seller may be able to do okay depending on the type of asset being sold and, of course, the owner-seller’s expertise, experience and resources. In the case of a business, very few business owners can even begin to do justice representing themselves. Why have I gone into such depth on this question of how the owner-seller of a one-of-a-kind asset can be sure he or she gets a fair price? Because I’ve seen many people fret and toil over the uncertainty. I’ve seen it tear apart people, partners and families. I’ve seen business owners waste thousands of hours, squander a lifetime of credibility, and needlessly put loyal employees through years of uncertainty – all because they desperately wanted to sell for a high price but did not fully understand the dilemma. And if they did understand the dilemma, they did not avail themselves of the solution – a broad, thorough and time-focused buyer search that brings multiple offers and creates competition. Choose well and your net price will be considerably higher than it would have been otherwise. It’ll also go much more swiftly.